Something mentioned tonight at School of Community triggered me thinking about the role of experience. Don't take the following to be a critique of tonight's School of Community, because it is not. The one merely served as the trigger for the following. In CL we make a great emphasis on the importance of experience and rightly so. But I think sometimes we slip a bit when it comes to why it is important. We are not looking to verify our experiences. And, in particular, we are not looking to verify our feelings (which certainly is a dimension of experience, but often what we reduce all of an experience down to). We are looking to verify truth. In a very concrete way. We are looking to verify, in our experiences, the truth. What CL is saying is that experience is the place in which this becomes possible. But let's not lose sight that it is truth that we are after. Consider again the wonderful passage from St. John about the encounter of Andrew and John with Christ and how it beautifully opens with the Baptist's claim "Behold the Lamb of God!" and closes with Andrew's words to his brother "We have found the Messiah!" Why was Andrew's experience of the encounter with Christ so vital? Not because it verified his experiences. But because it is in that powerful encounter he was able to verify the truth of the Baptist's claim and that fact took on concreteness for him and his life. The face of Truth became known. Okay, I'm done rambling. Just felt the need to clarify on this. 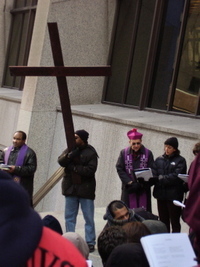 No fabulous commentary this year as I was only able to stay for the first couple stations of the Way of the Cross that our local CL community conducted through the streets of downtown Chicago. Nonetheless, it is amazing how much the event has grown. We have a website now. Parishes (including my own) announced the event. This year, the city not only didn't lose our permit application, but granted us a permit! And the police fully supported us in our intersection crossings. News media and reporters attended. And Bishop Paprocki participated with us. 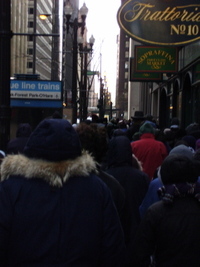 Even the 25 degree weather (before wind chill) didn't scare off too many people. The one benefit of not being able to stay is that I'm the only one capable of taking a few of the shots you see below. Not bad for a point and shoot camera, shooting from quite a few city blocks away. Have a Blessed Easter! Positng will resume sometime next week. Well, I hope that those two new The Religious Sense posts keeps my few readers busy for the next couple of days. As those of you who follow Intentional Disciples know, I am heading to Rome for a papal audience in honor of the 25th anniversary of pontifical recognition of the Fraternity of Communion and Liberation, which is the lay movement founded by Fr. Giussani. When I return, we will resume our look at Fr. Giussani's writings. Plus, I'll have stories from my trip. If you are interested, EWTN is broadcasting the papal audience both live (5:00 am, CDT) and an afternoon replay (3:00 pm, CDT) on Saturday. If your cable company doesn't get EWTN, you can watch it live over the Internet at this link on their website. 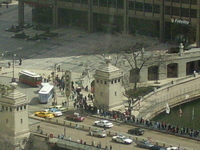 Also, if you live in the Chicago area and are looking for some way to make a concrete expression of your faith this Good Friday, consider joining us for the Way of the Cross, through downtown Chicago. More information can be found at the event's website. Bishop Paprocki will be participating this year. Recap: We have finally worked our way through the three premises -- realism, reasonableness and the need for a love of truth more than yourself -- that Fr. Giussani finds critical to understanding any element of human experience. Fr. Giussani summarizes this all by saying, "one must be open to the demands imposed by the question [the thing being studied] itself." Intro: Now we will begin to look at the phenomenon of religious experience, or the "religious sense", as Fr. Giussani likes to refer to it. This chapter presents us an introductory look at this phenomenon. How to Proceed: The first question that Fr. Giussani asks is how do we begin to take a look at the religious experience. As we talked about in earlier chapters, Fr. Giussani identifies the religious experience as one about the human person, and thus requiring existential inquiry. (The method is determined by the object.) So we must look at our own experience, in all its factors, and see it for what it is. "observe one's own movements ... within his or her daily experience. Hence the 'material' of our starting point will not be any sort of preconception about or artificial image of oneself, or even a definition of oneself, perhaps borrowed from current ideas and the dominant ideology. Recap: In the previous summaries, we took a look at two of the three premises that Fr. Giussani wants us to consider. First, in the summary of Chapter 1, we looked at the need for realism. Second, in the summary of Chapter 2, we looked at the nature of reasonableness, how it is the capacity to become aware of reality and how we perceive a behavior as reasonable if it indicates adequate reasons for itself. Today, we will look at Chapter 3 of The Religious Sense, and the final introductory premise: the impact of morality on the dynamic of knowing. Intro: You will recall in the last summary we noted how there are a diversity of procedures for reaching certainty. That the way in which we become certain that water is made of hydrogen and oxygen is different than the way in which we become certain that we can trust a business partner. Fr. Giussani notes that this latter act -- trusting a person -- depends on something more than just "the soundness of the reasoning process". It depends on "a new factor, namely, the attitude of the person -- usually called 'morality'." In this chapter, we will look at how morality impacts how we come to know something. Reason Inseparable From The Unity Of The "I": Fr. Giussani begins this chapter with two examples of people doing poorly in comparison to their ability. The first, a young woman who is an ace at math, does badly on an exam because of a stomachache. The second, an aspiring writer, writes a barely passable composition after having eaten and drunk too much at a dinner party. In both examples, the person didn't lose their ability to do math or write well. They simply were feeling ill. The point? Fr. Giussani wishes to indicate how there is a unity between "the instrument of reason and the rest of the person." "Man is one, and reason is not a machine that can be disconnected from the rest of the personality and then left to operate alone like some spring mechanism in a toy. Reason is inherent in the entire unity of our self; it is organically related to it." We have all had experiences of this. Think about the last time you got hurt in an accident or a girlfriend/boyfriend unexpectedly dumped you. How was your reasoning affected by those events? Recap: In these first three chapters of The Religious Sense, we are examining three premises about the human experience that will help us in examining religion in particular. In the summary of Chapter 1, we looked at the need for realism in our approach to the things -- the objects -- we encounter in life. And from that we considered that the method to learn the truth of an object is given by the object and how matters of human experience need to be examined through existential inquiry and that that can result in learning of objective things. "[Reason is] the capacity to become aware of reality according to the totality of its factors. The term reasonableness, then, represents a mode of action that expresses and realizes reason, the capacity to become aware of reality." It is worth pondering over these definitions for a moment. If you followed Pope Benedict's Regensburg lecture and the outcry around it, one of the things Pope Benedict was pointing out was the need for this broadening of reason beyond the narrow terms we have become used to in modern times. What is appealing about Fr. Giussani's definition of reason is that it doesn't deny anything a priori. It is ready to tackle all of reality. It doesn't tie reason to a specific method, thus denying the possibility that anything not discoverable through that method could in fact be reasonable. Background: Before I dive into the review of The Religious Sense, it makes some sense to set the stage. As I mentioned in my first post, Fr. Giussani is tracing out a long path. This first book of his Trilogy focuses on the human experience. Fr. Giussani is convinced, much in the same way that St. Augustine suggests in his famous line, "Lord, our hearts are restless until they rest in you," that our very humanity points the way to Christ. So in this work, Fr. Giussani focuses on what it is to be human and a recovery of a full sense of what is meant by reason (far broader than modern reductions to that which can be shown with the methods of science). In that way, until we reach the point of the Incarnation (something which will come when we look at At The Origin of the Christian Claim), the question of God will be approached in a very natural way. It may feel weird for a time, to speak of "Mystery", "Another", "the Infinite", but its purpose, again, is to recognize what is revealed by human experience -- and at this stage, prior to Revelation, particularly the event of the Incarnation and the encounter with Christ. So with that, let's look at Chapter 1. "By realism I refer to the urgent necessity not to give a more important role to a scheme already in our minds, but rather to cultivate an entire, passionate, insistent ability to observe the real event, the fact." From time to time, I participate in the comments section of Scot McKnight's blog, Jesus Creed. I know for a fact that a good number of you find your way to Integrity from Scot's site. The reason that I like participating at Scot's site is that, while it is part of the protestant "emergen[t][/][ing] movement" conversation, it is the most open of the EC blogs that I have seen to truly exploring the questions that movement is supposedly considering. It's one of the few spots in the EC conversation that doesn't spend all of its time talking about, basically, a handful of recent U.S. protestant pastors and their pop-theology books. It takes tradition and history with a degree of seriousness that is lacking in a lot of places. That's not to say it's all a bed of roses. There's a certain way in which the participants at Jesus Creed are willing to open the door to tradition but they've left the chain on. They are willing to pluck what they like, but not risk what they have. It's understandable. We all do that in areas of our lives. But it can lead to obstacles. And that's how I felt in a recent conversation when I emphasized that the method of looking at the question may have been responsible for why the answer eludes them. The request was put to me to explain more about how I approach the question and what I meant by method. So this post begins an examination of The Religious Sense, At The Origin of the Christian Claim and Why The Church? -- the trilogy of works of Fr. Luigi Giussani, founder of the Communion and Liberation movement. What does that have to do with my approach to the question? Well, for starters, anyone who has read this blog in the past 2 years knows that I have become involved with CL. I think one of the things that attracts me so much to CL is it is the articulation of much of my experience in my own faith journey. Second, I truly think CL tries to give life to the basic expression of our Catholic faith, nothing more. In that way, while not everyone may want or be called to the life of the CL community that has developed, I think what the charism helps spotlight again about the faith can be appreciated and absorbed by all. But most of all, I think Fr. Giussani's approach helps restore the universal accessibility of the faith. All too often, any conversation on the matter of faith begins in the middle, with some question of high theology. And everyone engages the question, often in a mechanical way, applying their predispositions and established ideologies. To honor Tradition must be to downplay the Scriptures, goes one. Particularly, when Tradition illuminates a meaning of the Scriptures that I would prefer not to be. To that, Fr. Giussani asks us to not race ahead so fast. Don't set what you have been given to the side. (The notion that one can free oneself completely of one's culture and predisposition is a false one.) But he says, let's first look at us. Our experience of humanity. Do not be afraid to examine that experience. It stands to instruct. And then move forward from there. Christ did not come to call us out of our humanity. We are more man because of Him. And, finally, Christ didn't offer the apostles one thing and the rest of us something less. The Church continues His Presence throughout time. Several things appeal to me about that approach. First, some common ground can be found. Not just between Catholics and Protestants, or Christians and other religious people, but us all. Second, I think it helps us remain open to what is before us, to face reality and not some comfortable, but ultimately reduction or false image, of reality. And it helps us to remember Him and why we follow Him, versus the moralism, ideology or utilitarianism that can sometimes seep into our approach to Christianity. For a while, I have thought that the EC would appreciate what Fr. Giussani has to say and might find his words of some help. But rather than waiting for someone else to discover him, I'll take up the task and do a chapter by chapter review (for as long as I can keep up the motivation!) of Giussani's works. The first one is The Religious Sense, which focuses on our human experience. Next time I will post on the first chapter. One last thought: from time to time, I will make reference to the encounter of St. Andrew and St. John with Christ (John 1:35-42). It was a favorite of Fr. Giussani's and I think I have come to understand why. In it, he sees encapsulated the Christian experience. So read it over and reflect on it. Okay, one additional thought: Be patient and compare everything against your own experience. I am going to take my time working through the material because it is quite dense. And so it will be quite a while before the posts are expressly about Christ and some of you may be frustrated with the journey. Well, if mankind had to wait however long it was for the Incarnation, I think you can endure the ride for a couple weeks as we follow the path Fr. Giussani has set us out on as our guide. Most of all, though, by going slow I think we will be more likely to ask ourselves whether we recognize the truth of what is being said in our own lives. To read all of these summaries to have a sense of what Fr. Giussani teaches is one thing; but to read them as a help to examining your own life is much better. This past Saturday, our local CL community had its first assembly of 2007. For those not familiar, an assembly is simply a gathering of the local community for the purpose of continuing the work of our schools of community, but done as a gesture of our unity. The last quote comes from the first part of The Journey To Truth Is An Experience, where Fr. Giussani takes a look at the question of why the apostles followed Christ when they understood so little of Him. He argues that they did so because He became the center of their affection because in Him they found their whole human experience understood and clarified. From there, Fr. Giussani concludes that to meet Christ we must first be ready to take our experiences seriously. In fact, this method, is critical to the charism of CL. experience means to live what causes me to grow. experience is not the doing or the setting up of relationships with reality in a mechanical way. What characterizes experience is our understanding something, discovering its meaning. This is done by discovering its link to everything else. the connection that binds something to everything else is an objective one. Therefore, true experience involves saying yes to a situation that attracts us; it means appropriating what is being said to us. It is composed of making things our own, but in such a way that we proceed within their objective meaning, which is the Word of an Other. True experience mobilizes and increases our capacity to accept and to love. nature weaves an organized, multi-leveled fabric that awakens the need for unity immanent in each one of us. The ability to properly perceive the meaning of that encounter. The value of the fact which we encounter transcends our power to understand so much so that an act of God is required for an adequate understanding. The same gesture by which God makes His presence known to humanity in the Christian event also enhances a person’s potential for knowledge, raising him up to the exceptional reality to which God attracts him. We call this the grace of faith. An awareness of the correspondence between the meaning of the fact that we encounter and the meaning of our own existence, between the reality of Christ and the Church and the reality of our own person, between the encounter and our own destiny. It is the awareness of this correspondence that brings about the growth of the self, an essential component of experience. I post all of that, not because I think it is instantly clear, but in the hopes that you might mull it over. Experience is the key to dicovering the truth of the faith within my life, as something not abstract, but real and valuable. Is is the key that transforms for St. Andrew the Baptist's claim, "Behold the Lamb of God," into "We have found the Messiah!". All too often I think Catholics make the mistake of thinking that experience is just subjectivism or sentimentalism and thus something that is at odds with the truth. And, when we think that, we make the error of teaching the faith as an abstraction, a collection of dogmas, that in truth have little connection to my life and thus don't actually pervade my life. Don't actually help me live. Tonight, we resumed School of Community here in Chicago. It is a bit of an adventure this year for me, as four of us from my old School of Community decided to start a new one on the northside of Chicago. For those not familiar (and who haven't clicked on the link above), School of Community is a public gesture of the Communion and Liberation movement. 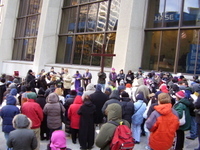 Typically, it meets weekly and can in some ways be described as the "catechesis" component of CL. But that description is inadequate. Those familiar with this blog or who have investigated CL some, know that CL is very much an education in the Christian life. Captured in his Trilogy, Fr. Guissani posits some fundamental claims: (1) a perspective about how we as human beings are made and interact with the reality before us and what our true and deepest desires indicate (leading to a hypothesis about revelation); (2) the encounter with Christ and the method He employs for knowing and following Him and ultimately knowing and being ourselves; and (3) the existence of the Church as the prolongation of Christ's mission and the place where His presence is encountered now. School of Community is a place where, usually using some text, we take up these claims and methods to increase our awareness of reality and to judge our experience. In this way it is different than what most people might think of catechesis. It isn't just the presentation and study of the objective truth claims of the Church. It is also each of us being a help to one another in increasing our awareness of how we experience things, what we have experienced, and to judge for ourselves these claims of the Church to see if we can verify them. It is the hard task of confronting Christianity with respect to me, my "I", and not as an abstraction or set of far-off ideas that I repeat because I've adopted what the culture speaks of. Anyway, the School of Community tonight was a wonderful beginning. Good to see two of the members who I haven't seen in a long time. Wonderful discussion and challenge, and awesome to see us taking up the charism anew and applying it to our experience, as we worked through the text at the same time. It was exciting! And that's part of what is so wonderful, because this new School of Community is part of an effort to embrace the public nature of this gesture. Fr. Guissani would often speak of John and Andrew's first encounter with Christ as emblematic of the encounter with Christ that we all are called to and the method that Jesus (and thus the Church) proposes for knowing and following Him. There's a second part to that encounter with the Lord -- Andrew's eagerness to share what he had discovered with his brother, Peter. I think we see our new School of Community effort, and the natural invitations to "come and see" that the different geography and our efforts carry with them, as an expression of this. If you (or someone you know) is in the northside Chicago area (or Chicago in general) and would be interested in coming and seeing (as the Lord invited John and Andrew to do with Him) what CL and School of Community is all about, drop me an email and I will get you connected.